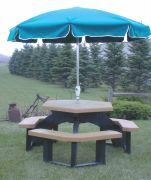 Plastic Recycling of Iowa Falls, Inc. offers a new hex-shaped recycled-plastic picnic table. Manufactured from 100-percent-recycled plastic, the table is a stylish addition to any seating area. Nine molded plastic shapes fit together with ease, eliminating cumbersome assembly that is typical of many stick-together tables. The tabletop measures more than 40 inches, providing ample area to accommodate six people comfortably. The top and seats have an attractive beveled edge for additional style. Other products by Plastic Recycling of Iowa Falls, Inc. include a full line of traffic-control products, park furniture and plastic lumber. The new trash and recycling receptacle holders from Pilot Rock feature all-steel and welded construction for maximum durability. The Amherst Series Street Scape Receptacles come in square or round shapes, both with 32-gallon capacities. The vertical steel straps are of alternating widths, with four horizontal reinforcing bands to provide strength. The powder-coated finish is offered in three colors. A wide variety of steel or plastic, trash or recycling lids are available. Each receptacle can be anchored directly to the surface or installed with raised pedestal mounts. Create an interactive musical playground experience with the new colorful chimes from Playworld Systems®. They can be easily added to existing play structures or areas or they can be grouped with Playworld Systems® bells and drums to create a separate music center. Three different chime sets provide six different tones and can be placed on panels or banners. The chime banner displays one set, while the chime panel holds two or three sets and is an accessible activity. Barco, an international company based in Atlanta, designs and develops solutions for large-screen visualization, display solutions for life-critical applications and systems for visual inspection. Barco will supply and install the video and scoreboard equipment at the new Montgomery Riverwalk Stadium in downtown Montgomery, Ala. The new stadium, which holds more than 6,000 fans, will house the new Class-AA Affiliate of the Tampa Bay Devil Rays, the Montgomery Biscuits. Built into a historical train station, the $26 million ballpark will include a 10-foot-by-36-foot scoreboard system, topped off with a 12-foot-by-21-foot RGB LED video display for live video footage and instant replays. BP International recently designed and installed two innovative waterproof fabric shelters, complete with lightning rods, for golfers who might be surprised by bad weather while out on the course. Located at the back of the ninth and 18th holes of the Johnny Miller-designed golf course in St. Cloud, Fla., the 24-foot-by-24-foot conical pyramid frame structures each accommodate nine golf carts and occupants. Lightning protection comes from one rod per structure, grounded 10 feet deep. BP International manufactures a full line of tennis court equipment, athletic field and gym equipment, custom netting, fence screening, and fabric architecture shade structures. RealSports, from Visual Sports Systems, is an advanced line of interactive virtual sports activities for health and fitness clubs, multipurpose sports centers, and athletic training centers. RealSports uses real-time, computer-simulated video responses to challenge players to an exciting, accurate and realistic indoor sporting environment. RealSports allows users to play six different sports in one system golf, hockey, soccer, baseball, football and basketball. Adjustable play modes make the system effective for both recreation and skill training. GameTime offers the new TotStuff line of playground products that are designed for smaller or light-traffic facilities. Designed with two 5/8-inch O.D. uprights, TotStuff is perfect for daycare providers, churches or any customers looking for a low-cost playground alternative to meet the needs of their smaller facility. Customers like daycare centers that are often caught between heavy-use playground equipment and plastic equipment designed for home use now have an option that focuses on their needs, giving them a product that will last at a price they can afford. Acu-Trol Programmable Controllers offers its new PoolPCTM, a water-quality management system designed specifically for residential pools and spas. The new PoolPCTM is a battery-powered controller to monitor water quality and recommend exact dosing amounts for in-ground or above-ground pools, spas and even portable spas. Designed to take the guesswork out of balancing water, it uses a simple yet sophisticated software platform called Acu-Trol Intelligence. An easy-to-use control panel displays exact water conditions, while a visual alarm indicator shows unsafe water conditions, and a proven chemical and temperature sensor makes maintaining water balance simple.